Perfect binder for scrapbook enthusiasts. This 12x12 Scrapbook albums 3 ring edition comes with a presentation window on it's cover for a photo or description card. It makes it ideal for scrapbook enthusiasts to display their work. This 12 x 12 Scrapbook Binder is the perfect size for making photo albums as well. Matching page protectors for this Scrapbook 12x12 album is also available - see Item No. 15100. Also available is the 12 x 12 Scrapbook Combo. which includes binder and page sleeves in one unit. 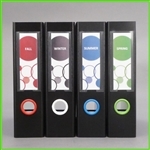 The 12 x 12 binder is made in up to 65% recycled and archival safe polypropylene. Curved edge at front and color matching finger ring at spine for easy pull from shelf as well as label holder at spine combines a functional design with the appeal of simplicity as known from Scandinavian design. Front presentation window for 3-1/2" x 3-1/2" photo or description card. Black powder coated metal-rings. Reduce risk of nickel allergy. Holds 280 pages WITHOUT page protectors (standard copy paper, 20 Lb). Holds 160 pages WITH page protectors (two pages per protector, back to back); each folder can hold 80 sheet protectors. Available color: Black & Inside White, Black & Inside Green, Black & Inside Red. Sold: 1 unit (individual wrapped in a sealed bag). 12 pieces per master carton. Equipped with a 3.5 x 3.5 photo insert cover, this 12x12 Scrapbook Binder is the perfect way to setup a presentation that need to stand out or for use as storage devise for scrapbooks that are in the making. Simply place into the front window a photo or short description to provide your viewer with a quick idea of what the contents are inside your binder. It is a fun and simple way to get the message out as what to expect inside the 12x12 file folders. There is of cause also the label holder at the spine easily changeable with the hidden finger hole on the inside of the spine. Slide out the old label and insert a new in a jiff with the use of the Keepfiling label templates. To get more value out of your new scrapbook folder use this opportunity and download one of the many free templates available from Keepfiling. It will make the binder more fun and playful to work with and for sure make it standout even though it already have a distinguish design this will for sure make it a joy for the eye and a lot more personal. The square 12 x 12 format is in many ways an ideal size also for use with photo album making. It is roomy for creativity to unfold and a joy to work with also in the long run. For sure any scrapbook enthusiasts will find this 12 x 12 Scrapbook Binder to be an excellent partner in making fantastic scrapbooks and a practical companion when organizing of 12x12 pages and filler material is to be sorted and divided between binders at a later point. Happy Scrapbooking. Presentation window: Yes in front cover holds one 3.5 x 3.5 card. Ring Capacity: 280 Pages (standard 20 Lb copy paper). keepfiling no. 15100 with paper inserted. Am using these binders to store and display a large, and growing, collection of U.S. meter mail, arranged according to the ID numbers listed in the online U.S. Postage Meter Stamp Catalogue. They hold archival pockets for #10 envelopes and full-size envelopes with meter mail very well--the items lie flat in the binders, which are stored upright, and the binder completely covers the stock sheets, protecting them perfectly. The large labels on the spines allow for easy identification of the contents, are very visible even up on a shelf, and are easy to remove, correct and replace. I have found no other product that works this well for this type of collection. Great price, too! Many thanks--will be buying more and recommending these binder to other collectors. I’ve been scrapbooking fir many years and have made approximately 90 albums. I wanted a binder to put them in that would last and be easily opened when someone wanted to look at the photos. These binders are perfect! I just love them so much! The binders I ordered are wonderful. I have been making pages for my 4 grandkids with pictures and memorabilia. These binders are perfect to keep the pages in. I love the little window on the front - another spot to add a picture! Thank you so much. I am extremely satisfied with the quality of the binders I received. 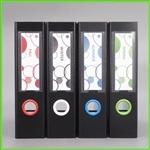 Your products are higher quality than any other office supplier I have used. Also, when ordering your staff has been very helpful with billing questions. Oddly enough, I'm not using these for scrapbooking, but for DVD's & possible CD's. I have pages that hold 8 discs, which means they would stick out of a regular binder by over an inch. These will work fine & look great! Now we can put all our DVD's in these instead of taking up tons of shelf space!